There are many indications that the euro is preparing for a fall, but don't short the euro just yet. Since hitting a 2014 peak on May 6 of $1.3929, the euro has lost close to $0.08 against the dollar, or 5.4% as of Tuesday's close. 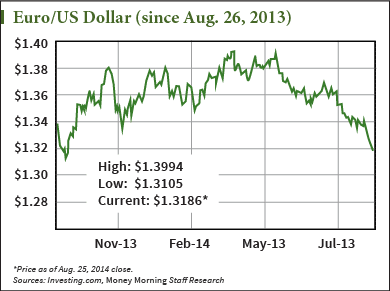 At $1.317, the euro is trading at its lowest levels since September 2013. Now there are a handful of economic factors taking place in Europe that all point to a lower euro value. But before you try to profit off the weakening currency, it would be wise to wait for the market to kick out some of the bears. The currency is likely to rise in the short-term before starting its long-term slump. The economic factors are ripe for European Central Bank President Mario Draghi to begin a widespread sovereign bond-buying spree across the whole of Europe, thus fueling inflationary pressures and pulling down the value of the euro. Inflation in the Eurozone dropped to a four-and-a-half-year low of 0.4% in July and unemployment is at 11.5%, according to Eurostat, and quantitative easing is becoming inevitable. 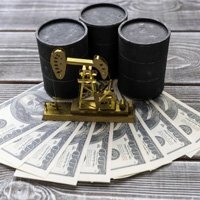 "This is pretty much set in stone; it's a question of 'when' at this point and no longer 'if,'" said Money Morning Resource Specialist Peter Krauth said. The weakening of the euro would not just be a symptom of large-scale euro stimulus, it would be a direct goal of policymakers. The financially weaker periphery countries of the Eurozone, such as Portugal, Ireland, Greece, and Spain, whose current account deficits helped to precipitate and inflame the financial crisis in Europe, would love to see the euro weaken to bolster exports. But the ECB is only in control of monetary policy levers, and for the Eurozone to properly fight the looming threat of deflation – and for a substantial devaluation of the euro to take place – the member countries are going to need to coordinate more closely on a fiscal policy. "Unlike in other major advanced economies, our fiscal stance is not based on a single budget voted for by a single parliament, but on the aggregation of eighteen national budgets and the EU budget," Draghi said at the economic symposium last week in Jackson Hole, Wyoming. "Stronger coordination among the different national fiscal stances should in principle allow us to achieve a more growth-friendly overall fiscal stance for the euro area." Hi..Angela, I've been reading and joing your site..it's nice to FINALLY meet you'll and be able to read up on this BUT U STII DONT QUITE UNDERSTAND IT YET.